Combine wine, soy sauce, and xylitol or erythritol (optional) in a large resealable plastic bag. Place tenderloin in bag, and refrigerate overnight, or at least 8 hours. In a small bowl, combine mayonnaise, sour cream, mustard powder; mix well. Mix in minced chives if you wish. Chill until ready to serve. Preheat oven to 325 degrees F (165 degrees C). Place meat and marinade in a shallow baking dish, and roast for 1 hour, basting occasionally. Temperature of meat should register 145 degrees F (63 degrees C). Let rest for a few minutes, then cut into 1/2 inch thick slices. 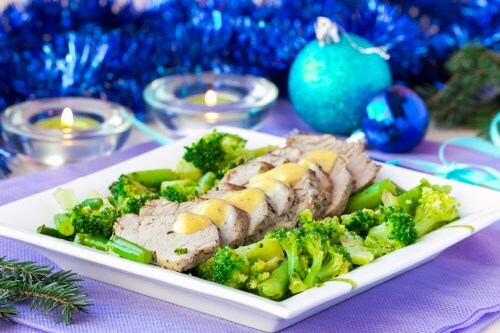 Serve with mustard sauce.